The falling dollar has been pushing up the price of gold to new heights as also the political climate in the United States. 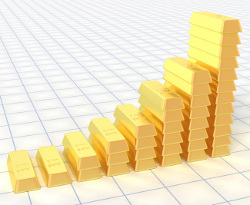 Civil unrest in different parts of the world has also been a contributing factor to the meteoric rise of gold prices. Gold-quote.net released today a 'Gold Value Estimator', in the form of an online tool or "web widget" that enables visitors to know the correct value of their gold jewelry. This free widget can be installed freely on any webpage, including Blogger blog, and even on a basic Google homepage. This October, bankers in Hong Kong were in for a rude shock when they discovered some gold bars from the US to be actually gold plated tungsten i.e., fake gold bars. With the threat of uncertain times ahead, gold takes on the glow of a stable commodity, which will always be able to buy goods and services. Did you know? Gold bars are pure gold. Is there a peak-gold like there is a peak-oil?